Prior Career/Professional Occupation: Avionics Specialist in the U.S. Air Force. Joined the Air Force in 2007, served in two tours of duty, left in 2011. BMW Manufacturing Co. manufactures the X3 and X5 Sports Activity Vehicles and X4 and X6 Sports Activity Coupes. Austin Tate served in the U.S. Air Force from 2007 to 2011. After two tours in the Middle East, he decided to enroll at Greenville Technical College and began studying Electronics Engineering Technology, as well as joining the BMW Scholars Program. 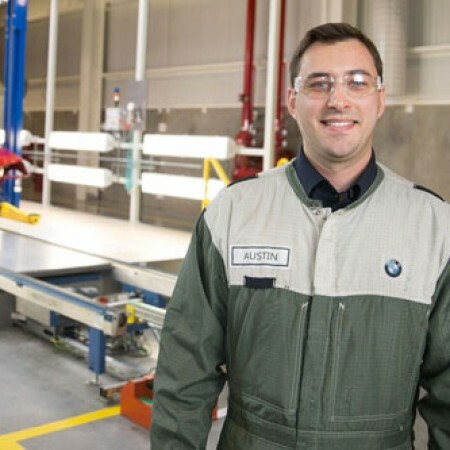 Upon graduation from both programs, Austin began his career with BMW as an Equipment Service Associate. Austin appreciates working for a large manufacturer like BMW and enjoys being part of the team that manufactures BMW X models for the world.